Despite its reputation as a medium of change, television has operated, from a content perspective, on the idea of doing “something different… but the same”. Networks are woefully afraid of being the first person to jump into the pool, so to speak, but love to be the second. Once someone has proved that the water is fine and there’s apparently an audience waiting for a new style of show, a new method of storytelling, or a new way of doing things, networks are quick to try to mimic that success, usually with an inferior copy. But those shows that are first? It’s a wonder they ever make it on the air at all, let alone last for any amount of time. I like those adventurous shows that take some chances, even if they fail. Experimenting with format or with methods of storytelling often create moments, or even entire series, that wouldn’t have the same impact any other way. It’s like discovering a whole new way of looking at things, opening my mind to a new reality. In the year 1995, with the impact of the computer on our everyday lives, that meant looking at virtual reality… and the levels that came with it. In 1995, VR.5 splashed upon our television screens. 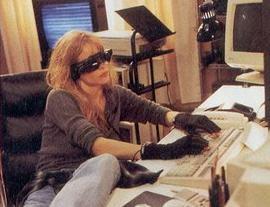 It starred Lori Singer as Sydney Bloom, a rather ordinary girl with a humdrum job as a telephone engineer and an obsession with computers. She lives her rather solitary life, interacting with strangers on her computer and dreaming about their lives as she hears them on the telephone lines and interacts with them with the rudimentary “virtual” world online. But that basic interaction is about to change drastically…. Sydney, with her homemade computer, discovers an entirely different and advanced virtual reality that allows her to “hack” into the subconscious minds of anyone she can reach with her modem. She can interact with others in this previously unattainable virtual reality “level 5” (hence the title of the series), and they are left with no memory of their experiences with her. She can discover their thoughts, their lies, and their motives as easily as making a phone call to them… as long as she can find her way out again. The only disconnect from the other person’s mind (and escape for Sydney back into the “real” world) is through touching an item in VR which connects back to “normal” reality. Her virtual adventures are visualized in the episodes using vivid, almost surrealistic scenes, with saturated color and items appearing and disappearing as if in a dream. Even Sydney herself changes from a somewhat geekish introvert into the stunning beauty her subconscious mind might allow her to be. The shared mental world often changes violently, with characters seen in black and white on still vivid landscapes, or only certain items remaining in color in a monochrome scene. While there are clues given to the truth or falsehood of these “memories”, viewers are left to discern much of the meaning. Obviously this wasn’t any reality these characters lived in; it was a reality of the mind. Unfortunately, it turns out that Mom Nora is now not much more than a mental vegetable, alone and closed off from the world after she lost her husband and Sydney’s twin sister Samantha in a car accident 17 years ago… an accident that Sydney blames herself for. Sydney then discovers she can use her newfound VR.5 ability to enter into her mother’s subconscious and interact with her once again… but what she discovers there are more mysteries than truths, more questions than answers. Fortunately, Sydney is not alone in her search for those answers. Sydney does have someone to turn to in all of this turmoil, childhood friend Duncan (Michael Easton), who knew the family back before the accident. He’ll stand by Sydney through thick and thin, and slowly demonstrates some affinity for the virtual reality world as well, although not nearly to the level of Sydney. The Committee becomes frustrated with Morgan’s apparent ineffectiveness (apparent only because Sydney has influenced him subconsciously), so Morgan is “eliminated” and a replacement is sent. The new watchdog, Oliver Sampson (Anthony Head), is much more contentious than Morgan and much better connected with The Committee. Sampson ultimately becomes an ally, thanks to Sydney’s discovery of betrayal inside The Committee, and there are now two major plots going on in the mythology of the show: the ultimate aims of The Committee, and the mystery behind what really happened the night of the accident 17 years ago. With the help of both Duncan and Oliver, the answers to both may just be found in Virtual Reality Level 5… and beyond. Translating a world of the subconscious into the visual medium of television was not an easy task. To create the surreal environment of VR.5 meant that scenes taking place during these “mind trips” involved taking the color film footage, transferring it to black and white, then individually coloring in those parts which needed to stand out with vivid hues out of the ordinary. Back in 1995, the entire process took literally weeks per episode, not to mention the attendant costs involved. While this meant a visually stunning look unique to VR.5, it also meant the show was a very expensive venture, one in which even the actors weren’t aware of the finished product until they saw it onscreen with the rest of the viewing public. The rather deep continuing storyline involving Sydney’s past was confusing enough for viewers, let alone for actors. The on-screen performers were working on scripts week by week with no knowledge of where their characters were headed, where they’d been, or even what was going on in the now. As part of the storytelling, deliberate continuity and factual errors were made in the virtual reality worlds, showing how perceptions changed over time and how some people remember events differently than others. When information given as truth is later denied, who’s to say whether the scenes shown represent any reality, virtual or otherwise? Fox aired 10 of the 13 produced episodes and, although they aired in the correct order in America (unlike Britain, which was more confused than we were), the three episodes skipped would have landed in spots 3, 9, and 12, meaning there are some definite plotlines missing vital information. Episode 3, in particular, was an examination of Sydney’s youthful relationship with her now dead sister, and some of the fallout from the accident. VR.5 definitely suffered from some problems, and heaping missing information onto deliberately misleading information didn’t help viewers at home who were still trying to decipher the new world of the show, let alone the unexpected and innovative ways in which the story was being told. “That” was VR.5… and there’s been no other television series, virtual or real, like it since. 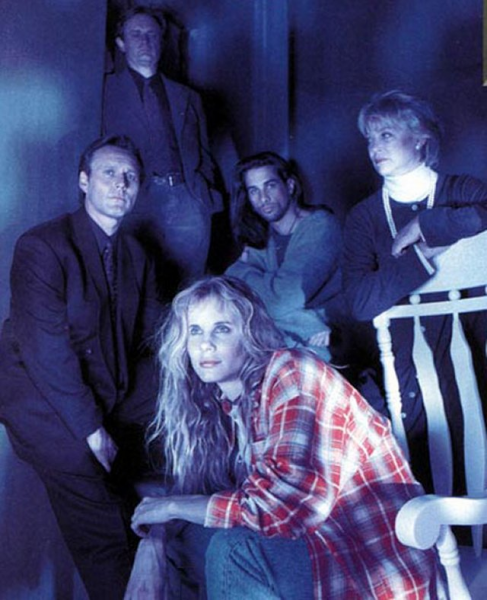 LORI SINGER (Sydney Bloom) followed in the acting footsteps of her brother Marc Singer (V), and landed a featured role on the TV series Fame. She also got to display her cello ability on the series, as she is a world-class instrumentalist who has performed at Carnegie Hall. Best known for her role opposite Kevin Bacon in the classic movie Footloose, she’s recently returned to acting in an episode of Law & Order: SVU after spending many years doing charitable work fighting Pediatric AIDS. MICHAEL EASTON (Duncan) started in soap operas on Days of Our Lives, then moved to recurring roles in Ally McBeal and The Practice before starring in a dual role in the series Two. An accomplished author and poet, he’s been a regular on the soap One Life to Live since joining the show in 2003. 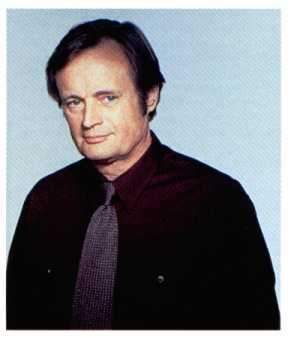 DAVID McCALLUM (Dr. Jonathan Bloom) was Russian heart-throb Illya Kuryakin on the late ’60’s spy series The Man From U.N.C.L.E., and later starred in the British series Sapphire and Steel and the 1975 American take on The Invisible Man. Since 2003 he’s been a regular on NCIS, learning so much information for his role as a Forensic Scientist that he’s been the featured speaker at legitimate forensic conferences. LOUISE FLETCHER (Dr. Nora Bloom) won an Oscar for her role as Nurse Ratched in the movie One Flew Over the Cuckoo’s Nest. Best known on television for her recurring portrayal of Kai Winn on Star Trek: Deep Space Nine, she’s also received two Emmy nominations for her roles in Joan of Arcadia and Picket Fences. Most recently, her TV appearances include Private Practice and Shameless. WILL PATTON (Dr. Frank Morgan) was a regular on the 2001 CIA series The Agency. He was also seen as the coach in the movie Remember the Titans. He is probably more heard that viewed, however, as he has been the reader of a lengthy list of audiobooks, including many of author James Lee Burke’s thriller series. ANTHONY HEAD (Oliver Sampson) is more recognized with the name he used later in his career, Anthony Stewart Head, and for his role as Giles in the series Buffy, the Vampire Slayer. He is currently playing royalty, portraying King Uther Pendragon in the British-produced series Merlin, which aired for one season on NBC and has continued on the SyFy Channel. VR.5 hasn’t been released on DVD, so if you want to own copies, you’ll have to go the bootleg route. Some kind soul has put all the episodes on YouTube if you wish to see for yourself Sydney’s adventures in both real and virtual terms (and yes, there’s some level of irony in watching televised virtual reality on a computer). Rhino did release the individual episodes on VHS back in the day, however. Websites include the excellent dismal light, which contains many links and much information about the series. While objective reality is fairly easy to describe and visualize, especially for the visual medium of television, the medium of the mind is something far different. VR.5 wasn’t really a representation of a virtual reality, but it used the idea of a “virtual” world to tell a rather involved story in a really different, engaging way. Upending the previous conventions of the medium and experimenting with time, space, and color in surprising ways, helped the series connect with some, and unfortunately turn off the interest of others. But for anyone with the willingness to experiment, and the desire to allow their minds to be open to new ways of (televised) communication, then VR.5 allowed its cast, crew, and creators to navigate a journey TV had never been able to portray before. The human mind is constantly expanding, growing, and changing… and television has to do the same, or it will simply become mindless claptrap that many have warned it was far before this. But willingness on the part of viewers to want more, and willingness on the creators to find a way to provide it, means television doesn’t have to be boring, bland, or ordinary. Like VR.5, it can challenge the senses, the world, and the mind. If only we open our own minds to it. Aired at Friday 8/7 Central? Yes. Fox was still searching for a companion series for The X-Files at the time, and this was one of the (unfortunately failed) attempts.